Op art, also known as optical art, is used to describe some paintings and other works of art which use optical illusions. Op art is also referred to as "geometric abstraction" and "hard-edge abstraction," although the preferred term for it is "perceptual abstraction." The term "Op" bears resemblance to the other popular movement of the 1960s, Pop Art though one can be certain such monikers were invoked for their catchiness and not for any stylistic similarities. "Optical Art is a method of painting concerning the interaction between illusion and picture plane, between understanding and seeing." Op art works are abstract, with many of the better known pieces made in only black and white. When the viewer looks at them, the impression is given of movement, hidden images, flashing and vibration, patterns, or alternatively, of swelling or warping. Op Art is derived from the constructivist practices of the Bauhaus. This German school, founded by Walter Gropius, stressed the relationship of form and function within a framework of analysis and rationality. Students were taught to focus on the overall design, or entire composition, in order to present unified works. When the Bauhaus was forced to close in 1933, many of its instructors fled to the United States where the movement took root in Chicago and eventually at the Black Mountain College in Asheville, North Carolina, where Anni and Josef Albers would come to teach. The term first appeared in print in Time magazine in October 1964, though works which might now be described as "op art" had been produced for several years previously. For instance, Victor Vasarely's painting, Zebras (1938), is made up entirely of curvilinear black and white stripes that are not contained by contour lines. Consequently, the stripes appear to both meld into and burst forth from the surrounding black ground of the composition. Also the early black-and-white Dazzle panels of John McHale installed at the This is Tomorrow exhibit in 1956 and his Pandora series at the Institute of Contemporary Arts in 1962 demonstrate proto-op tendencies. In 1965, an exhibition called The Responsive Eye, curated by William Seitz, was held at the Museum of Modern Art in New York City. The works shown were wide ranging, encompassing the minimalism of Frank Stella and the smooth plasticity of Alexander Liberman, alongside the masters of the movement: Victor Vasarely and Bridget Riley. The exhibition focused on the perceptual aspects of art, which result both from the illusion of movement and the interaction of color relationships, as seen in the painting by Arnold Alfred Schmidt. The exhibition was enormously popular with the general public, though less so with the critics. Critics dismissed Op art as portraying nothing more than trompe l'oeil, or tricks that fool the eye. Regardless, Op art's popularity with the public increased, and Op art images were used in a number of commercial contexts. Bridget Riley tried to sue an American company, without success, for using one of her paintings as the basis of a fabric design. Floor tiles at the Basilica of Saint John Lateran are an early example of an "op art" effect. Op art is a perceptual experience related to how vision functions. It is a dynamic visual art, stemming from a discordant figure-ground relationship that causes the two planes to be in a tense and contradictory juxtaposition. Op Art is created in two primary ways. The first, and best known method, is the creation of effects through the use of pattern and line. Often these paintings are black and white, or otherwise grisaille. Such as in Bridget Riley's famous painting, Current (1964), on the cover of The Responsive Eye catalog, black-and-white wavy lines are placed close to one another on the canvas surface, creating such a volatile figure-ground relationship that can cause a viewer's eyes to hurt. Another reaction that occurs is that the lines create after images of certain colors due to how the retina receives and processes light. As Johann Wolfgang von Goethe demonstrates in his treatise Theory of Colors (published 1810), at the edge where light and dark meet color arises because lightness and darkness are the two central properties in the creation of color. Bridget Riley later produced works in full color, and other Op artists have worked in color as well, although these works tend to be less well known. Josef Albers taught the two primary practitioners of the "Color Function" school at Yale in the 1950s: Richard Anuszkiewicz and Julian Stanczak. Often, colorist work is dominated by the same concerns of figure-ground movement, but they have the added element of contrasting colors which have different effects on the eye. Anuszkiewicz is a good example of this type of painting. In his "temple" paintings, for instance, the juxtaposition of two highly contrasting colors provokes a sense of depth in illusionistic three-dimensional space so that it appears as if the architectural shape is invading the viewer's space. Stanczak's compositions tend to be the most complex of all of the color function practitioners. Taking his cue from Albers and his influential book Interaction of Color, Stanczak deeply investigates how color relationships work. 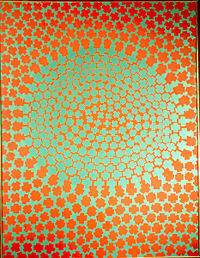 A large show of Op art was held in Strasbourg in 2005 (L'oeil Moteur) and another was held at Schirn Kunsthalle Frankfurt for February through May 2007. 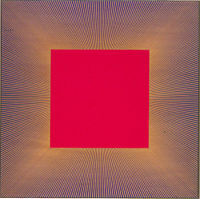 The Columbus Museum of Art, Columbus, Ohio, organized the first major retrospective exhibition of Op Art in the United States in over 25 years, called Optic Nerve: Perceptual Art of the 1960s, February 15 through June 17, 2007. 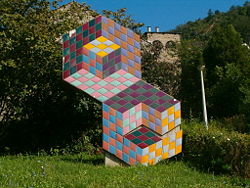 The Pratt Institute of Art also hosted an Op Art exhibition in the spring of 2007. Additionally, Bridget Riley has had several international exhibitions in recent years (e.g., Dia Center, New York, 2000; Tate Britain, London, 2003; Museum of Contemporary Art, Sydney, 2004). Although Op art is now considered relatively mainstream, photographers have been slow to produce Op art. Whereas in painting, Victor Vasarely and Bridget Riley were producing large amounts of art and the same can be said for many digital artists, such as A. Kitaoka. One of the primary reasons for this is the difficulty in finding effective subject matter. Another reason is that in order to produce Op art in the media of photography the images would need to be quite extreme, which would go against the nature of most photographers. However, it is thought by some that Laszlo Moholy-Nagy produced photographic Op art, and Noorali Hirani is currently producing Op art. ↑ John Lancaster. Introducing Op Art. (London, UK: BT Batsford Ltd. 1973). ↑ Jon Borgzinner. 1964. "Op Art - Pictures that attack the eye." Time (October 23, 1964) Retrieved November 30, 2007. All retrieved December 21, 2018. This page was last modified on 21 December 2018, at 15:42.